[PERFECT GIFTS FOR BOYS] - Small and easy to use, 1.2m drop resistant. With vivid Camo green exterior, compact bodies, ergonomic design and simple push-to-talk operation, intended for kids aged from 3 to 12 years old, these walkie talkies would be impressive toys and gifts for boys. 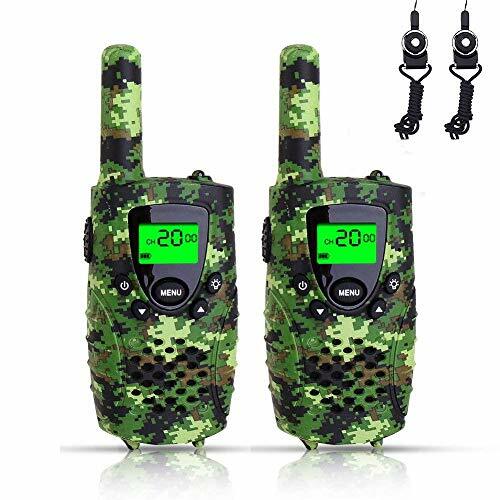 [UP TO 3-MILE RANGE] - Up to 3 miles effective range in open field and 1/2 to 1 mile range in residential area, this walkie talkie set has got you covered anywhere from outdoor adventures like camping, road-trips, to running in the woods, in the neighborhood, and to indoor activities like shopping to the mall and pillow talks. Kids enjoy using small walkie talkies as part of their role play wherever they are! [22 CHANNELS + 38 PRIVACY CODES+AUTO SQUELCH] - The walkie talkies for kids are equipped with 22 FRS/GMRS channels and enhanced by 38 CTCSS sub-channels/ privacy codes, which cut down drastically on outside interference to protect your privacy, and also feature an auto squelch system which automatically cut off weak transmissions?and?unwanted noise for clearer communication. [ADDITIONAL ADVANCED FEATURES] - including a backlit LCD display, built-in flashlight, earpiece connection, 10 ring tones, battery indicator, channel auto scan, power saving function, hands-free function (VOX), adjustable volume control, roger?beep, compatible with all standard FRS/GMRS radios. 3 AAA batteries required (not included). [BUILT FOR DURABILITY] - Sturdily built with eco-friendly materials, the mini walkie talkies are backed up by FAYOGOO¡¯s 30-day money back guarantee and 1 year warranty.